September has arrived, and that can only mean one thing on the global LGBT calendar – Oktoberfest – when thousands of gay men don leather lederhosen, gingham shirts, and head to Munich for the biggest drinking, singing and sausage-quaffing-fest of the year. But hold on a minute. If it’s called Oktoberfest, then why isn’t the event held in October? That is certainly a question that I asked myself, especially considering that this is an event held in Germany, a country well known for its pragmatic, well organised approach to life. This little idiosyncrasy seems peculiar doesn’t it, so I did some research and the answer is surprisingly, well, German. The reason is that extending the festival into September allowed even more time for festivities, fun and frolics during the beautiful early Autumn days that bless Germany’s most southerly state of Bavaria. Now what could possibly be more pragmatic and well organised than that. Oktoberfest actually runs from the middle of September until the first Sunday in October, and now attracts a staggering six million visitors every year. 2014 will mark the 205th anniversary of the first Oktoberfest, which was organised to celebrate the marriage of the then Crown Prince of Bavaria, Ludwig, and Princess Therese of Saxony-Hildburghausen on 12th October 1810, hence the name, and the celebrations have continued ever since. But what is so gay about that you might be asking yourself. Well, things didn’t really start to officially gay up until the 1970s, when a gay leather and fetish collective called the Munich Lions Club organised their first gathering in the now famous Bräurosl beer tent. It does seem a little curious that it took so long for a queer element to arise given the afore-mentioned dress code, however the largest LGBT gathering on Gay Sunday now attracts 8,000 mostly gay and lesbian visitors on the first Sunday during the event’s schedule. But this is by no means the only gay party that takes place here. 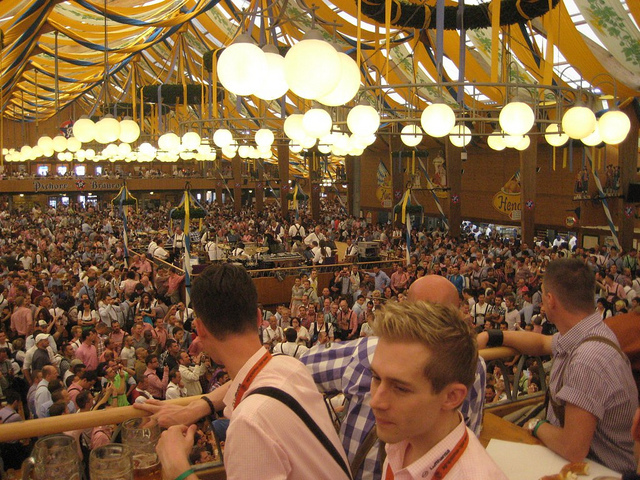 The very next day has been aptly called Pink Monday or RoslMontag thanks to the large number of gay and lesbian visitors, as does Prosecco-Wiesn which takes place on the second Monday in the Frischer Vroni tent. So what can one actually expect from a visit to Oktoberfest? Well essentially this is all about celebrating true Wiesn tradition. The Bräurosl beer tent is just one of 14 such tents that are located on the green open spaces of the Theresienwiese fairground, which is just on the outskirts of Munich itself. Each tent serves up their very own brand of Bavarian tradition, which in the Bräurosl tent means just one thing – entertainment. The Bräurosl has been managed by the Heide family for seven generations, and so they know a thing or two about what makes for a good Bavarian beer bash. The format is fairly uncomplicated – plenty of 6% German beer, served in one litre (2 pint) ‘masskruge’ mugs, and live music in the form of an oompah band belting out all manner of camped up cover versions. Then there is the venue – an extravagantly decorated drinking hall that can seat over 6,000 (mostly queer) patrons in long rows of communal tables, and you have the scene set for one hell of a party. It would normally be safe to assume that when you pack over 6,000 Euro-gays into such an environment that it is going to turn into a celebration. But when you add in some vaguely fetishistic costumes, copious amounts of alcohol as a social lubricant, and some oompah covers of Britney Spears, it is pretty much certain to go off – and it almost certainly does. Oktoberfest also offers visitors more than just the beer halls of course, and the fair also has plenty of other attractions, fairground rides and amusements to keep everyone entertained. It is a pretty safe bet though that once you get seduced by the fun-drenched atmosphere of the Bräurosl tent that you might never ever want to leave. Those who think that Bavaria is all about the beer and bawdiness would be mistaken, and the city of Munich, and the wider state of Bavaria hold some of the most intriguing sites and beautiful countryside for LGBT visitors. Munich itself is home to a thriving year-round LGBT scene, and also hosts one of the most popular pride events in the country. More information about everything that Munich has to offer, including where to stay and flight connections can be found on the Germany for LGBT microsite. 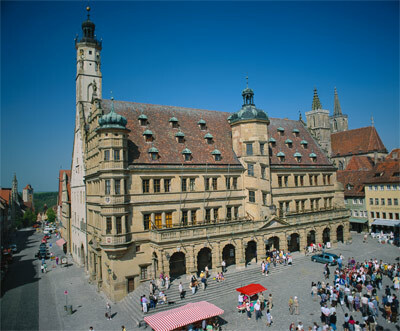 Head a little further afield and Bavaria is one of the most beautiful and enchanting regions of Germany to explore. This southerly part of country boasts a rich history, and is full of castles and lakes that are dotted throughout the mountainous alpine landscape. The Berchtesgadener Land is one such breathtaking destination, which is located just over an hour from Munich right in the heart of the Alps. As far as a picture-postcard setting goes, it doesn’t get much more irresistible than this. One of the most popular places to head for here is the Königssee Lake, which winds for miles up a valley that is flanked by towering and majestic Alpine peaks. 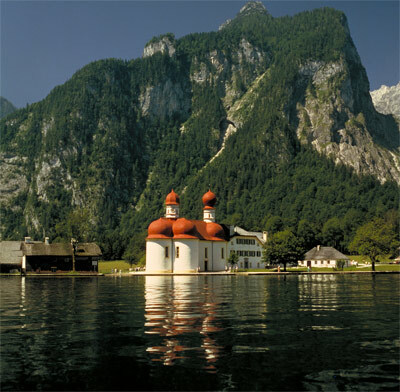 Boat trips on the lake are popular, especially to see the church of St. Bartholomew which perfectly epitomises Bavaria’s rich Alpine environment and heritage. Not only does this area offer the perfect photo opportunity, but also an idyllic environment in which to rejuvenate after enjoying everything that Munich and southern Germany has to offer. More details about everything that Germany has to offer for LGBT people is available on the Germany for LGBT website. Details of tickets for LGBT events during Oktoberfest can be found on the Münchner Löwen Clu’s website.